Our PS star baker Kathryn took to the skies in April this year along with our Chief Executive Diane & Fundraiser Emma. We chatted with her about what motivated her to take the plunge for PS! Congratulations on completing your Skydive! How did you feel when you landed? I was relieved to be back on the ground! Unfortunately I wasn’t very well immediately after landing (this might have something to do with the bacon roll I had just before my jump!). When we went past the point of no return I unfortunately started feeling a bit queasy. After the parachute opened it felt a bit surreal as it did not feel like we were getting any closer to the ground. My instructor was extremely experienced and looked after me very well. A few minutes after I landed I recovered enough to eat some of the birthday cake I had made to celebrate the 176th birthday of Pharmacist Support. 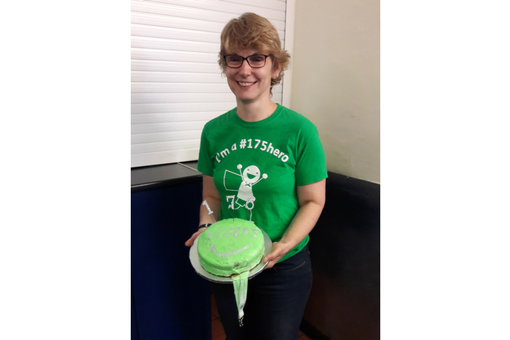 You’ve been baking cakes for Pharmacist Support to raise money, and now the Skydive. Why did you decide to do this in aid of the charity? I was diagnosed with depression in 2008 and have had 3 severe episodes since then that required me to take at least 2 months off work. Until I discovered Pharmacist Support at the 2015 RPS conference I was not aware that the charity existed. So I did not know that I could have received support from the Listening Friends service whilst I was off or professional advice when negotiating my return to work. I spent some time speaking to the Pharmacist Support team at the 2015 RPS conference and decided to sign up as a #175hero by pledging to raise £175. I use baking as therapy and know my colleagues enjoy my cakes, so I decided to be cheeky and ask my colleagues at Cardiff and Vale UHB, to give me a donation to the charity in exchange for a cake. I also took cakes to the 2016 RPS conference and the BPSA conference. I heard Diane announce at the 2016 RPS conference awards dinner that she was planning to skydive for her #175hero challenge. For some reason I tweeted that I had skydived before and could have my arm twisted to jump again with Diane. The original plan was to jump in December, but unfortunately I suffered a recurrence of severe depression in November 2016 and dropped out of contact with Diane. I came back onto social media in March and announced that I was recovering from another episode of depression. The first people to get in touch with me via Twitter was the Pharmacist Support team. When I found out that Diane and Emma hadn’t jumped and were planning to jump on Easter Saturday to celebrate PS 176th birthday I agreed to jump with them! I don’t think a lot of pharmacists realise that the charity exists and the extent of help that is available. I know that if I realised that Pharmacists Support existed during my depressive episode in 2015 I would have used the services available. I have been promoting my fundraising on social media (I’m @kmmurray97) for the last 2 years so have hopefully increased awareness of the charity to those who can benefit from the support they provide. I am extremely passionate about beating the stigma associated with mental health conditions and hope that by sharing my depression recovery journey during my work as an Ambassador for the charity I can help others suffering from depression know they are not alone and help is at hand. None of the services Pharmacist Support provide cost the service user anything. For these services to continue so pharmacists in the future can benefit, money has to be raised. You may not need help from the charity now, but you never know what challenges life will throw at you in the future. You raised an amazing amount of money. What would you like to say to everyone who sponsored you? I am extremely grateful to everyone who has sponsored me so Pharmacist Support can continue their important work. I have raised over £1000 so far and exceeded my original £175 goal. I am still baking cakes in exchange for a donation to Pharmacist Support via my Just Giving page. Cakes can be ordered via @kmurray97 and posted across the UK. I can make gluten free and vegan cakes. You can see all of our Fundraising Hero activities on our Wall of Fame!